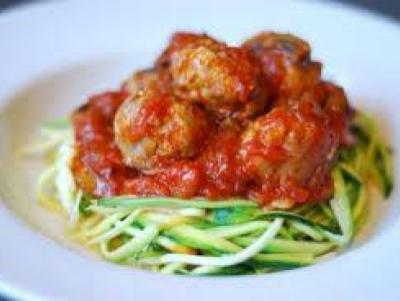 Mix all ingredients (minus the zucchini and marinara) together in a large bowl until they are combined evenly. Don’t be afraid to get your hands in there. Roll the mixture into meatballs. Heat a large skillet over medium heat. Drizzle with olive oil. Once the pan and oil are hot, add the meatballs one by one in an even layer. Cook for 5-7 minutes and then flip. Cook an additional 5 minutes. Add your favorite red sauce and bring to a simmer. Cover and cook on low for 15-20 minutes or until meatballs are cooked through. For the zucchini noodles, I used a hand held slicing gadget. “Vegetti”s are available on amazon or at most home good stores. Many markets now also offer ready-to-use pre “noodled” zucchini in their prepared produce section. Steam for a few minutes to soften the noodles, being careful not to overcook, and top with meatballs and sauce. Enjoy!! !